I love following Anton Atienza on social media – he consistently manages to make Edmonton look stylish, delicious, and somehow, not so cold in the winter. Long before he was posting stylish photos on instagram, Anton worked for me at the Edmonton Oil Kings games. He was still a student and it was just one season, but he left a lasting impression on me. He had no interest in hockey – but he certainly made the games more entertaining. As much as I enjoy following Anton out and about through the city on social media, I love even more when I run into him around Edmonton. He is a busy boy, but he recently pencilled me in for a request I had. Knowing that Anton was adding his style to photo shoots and store windows around the city, I asked if he would come and play in my closet. I often wear a lot of colour, so I was curious what the king of monochromatic ensembles would pull together for me. I had lured him with the promise of dinner, and as I played in the kitchen, Anton strolled around my apartment picking items from different closets, drawers and other hiding spots. Anton went shopping in my closet and quickly pulled three winter-appropriate looks. 1. Casual First, Anton collected a black pair of leggings and a 3/4 length black top. 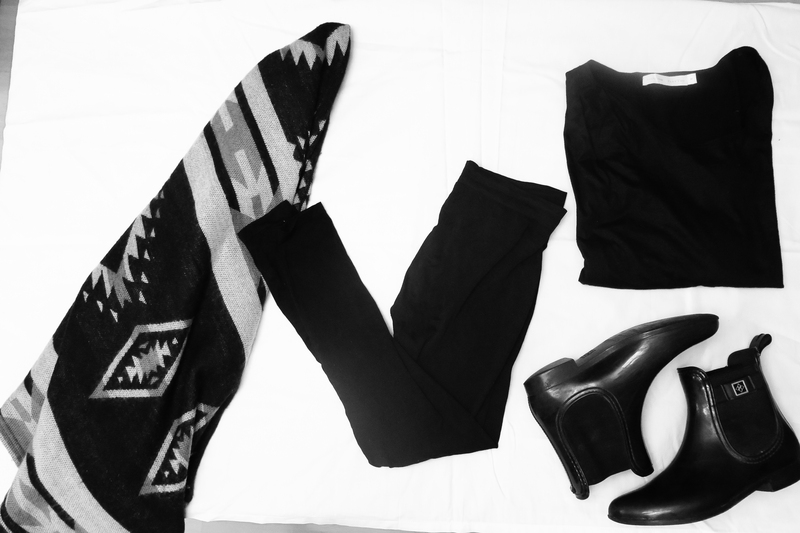 The basic black pieces were to be layered with a black and grey wrap-style poncho that The Spaniard brought me back from a work trip to Madrid. I love this wrap from The Spaniard, so I was happy to see this piece sparked Anton’s interest. To keep my toes dry in this slushy Edmonton weather, he finished it off with a pair of (well loved) black rain booties I have. Anton reached into my growing collection of vintage clothing for his second look. He paired a black and gold evening dress designed by Canadian designer Hugh Garber for Margo with a Canadian Hurtig Furs stole (both items I scored from local thrift shops). I absolutely love this look! Now… I just need a reason to bust out this outfit. Anton dug into The Spaniard’s closet for the last look. He wanted to show me how to take a classic men’s white collared shirt and accessorize it. Outerwear options included a rabbit fur hat I picked up at a street market in London along with a grey alpaca scarf I bought while backpacking in Peru. For jewelry, he dug out more sentimental items from my travels around the world – including two perfume holders I picked up at a street market in Poland. Paired with a navy clutch (another vintage piece), and i’m ready to go. I loved letting Anton dig around in my closet. The week after he visited me, he inspired me to pull out some basics in my closet as well as wear one of the perfume necklaces to work. I’ve moved twice in the past year – an experience that has illustrated just how many clothes, shoes, and accessories I have. My 2017 challenge to myself is to wear what I have already, rather than adding to the collection. Having Anton come over to style some outfits for me made me feel like I got to go shopping without spending a dime. Well, I did make him dinner, but he was worth it. I think Anton’s style service could become a hot commodity in Edmonton; he paired things differently than I have and even expressed love for some items I had forgotten about. My closet consultation ended up being a fun evening of food, fashion, and even a little bit of gossip – I think many ladies would enjoy a slice of style advice from Mr. Atienza. Looking for inspiration? You can follow and/or contact Anton on instagram or twitter.